We’ve been busy updating the Gecko Animation site at work lately, and we decided to get rid of some older content on there. Whilst this tutorial by @Laxy doesn’t really fit on the Gecko site anymore, it’s still a cool resource, so I said I’d put it up here. It’s slightly older but the principles of animation don’t really change, so it should still be of intrest! The challenge is to simply animate the character provided from one pillar to another. But to make your entry interesting you need an idea. When given a simple challenge like this, there are going to be lots of entries that will look very similar. So you need an idea to make your animation stand out. 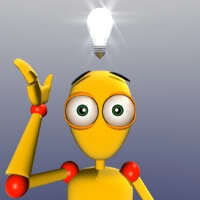 The best way to get an idea going is to think of a situation or an event, rather than an action. Make your idea a situation and this will cause the character to react. This will result in much more realistic actions. My idea was to simply make the platforms bendy. The character discovers this while leaning across to the other platform. He then improvises a solution with mixed results. Once I had thought of the situation it was easy and fun to work out how the character would react. This is the most important part of the animation process. Blocking is a set of key-poses that can fully explain the idea that you’re trying to animate. I didn’t save my blocking pass but here’s an early save of my animation (just after blocking). Start by making sure you organise your interface to include a timeline. Hit the Auto-Key button and start to set your poses. Auto-Keying Switched On (the Record Button). This fantastic rig allows for both IK and FK movements. I used IK animation for most of the scene, the only time I switched to FK was for when his arms were stretched out, reaching for the other platform. Switching made that section a lot easier. You can be as detailed as you like in your key-poses but your goal must be to get the right timing together. Don’t worry too much about detailed facial expressions or finger/toe movement, just concentrate on key actions and poses. Once you’ve blocked out your scene, have a look at what you’ve got and decide what needs changing. Blocking allows you to chance the actions and timing easier. Without blocking out your scene you might find you’ve made a mistake and aren’t able to make changes easily. You may not believe it but you’re nearly finished! Finalizing the animation now should simply be a matter of adding detail to in-between key pose frames. If you’ve done a proper blocking stage then this should be very easy. The best way to make sure you have a nice smooth accurate animation is to make sure you have clean F-curves. Use the curve controls to their full extent, rather than adding extra key-frames. Open the F-Curve Editor and experiment with the different Handle types of your curves. Open the handle types in the ‘Key’ menu of the F-Curve editor. Here you can see the effect of clean F-Curves on a simple bouncing ball animation. 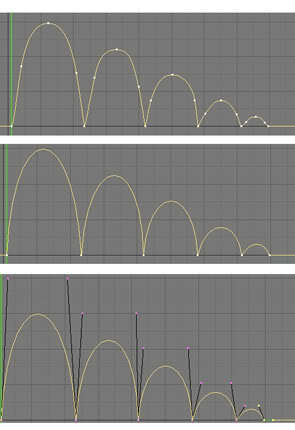 If you keep your F-Curves clean and fully use the correct handle types, your animation will be far more accurate. Once you’re happy with the extra detail, you can start work on the facial animation. Here you may want to refer back to your ‘Act like an idiot’ stage, and get a mirror to accurately reproduce the right expressions.